You know school is starting soon (Aug. 30 in Darien) when the state announces “Tax Free Week.” This year the week runs from Sunday, Aug. 19 through Saturday, Aug. 25. 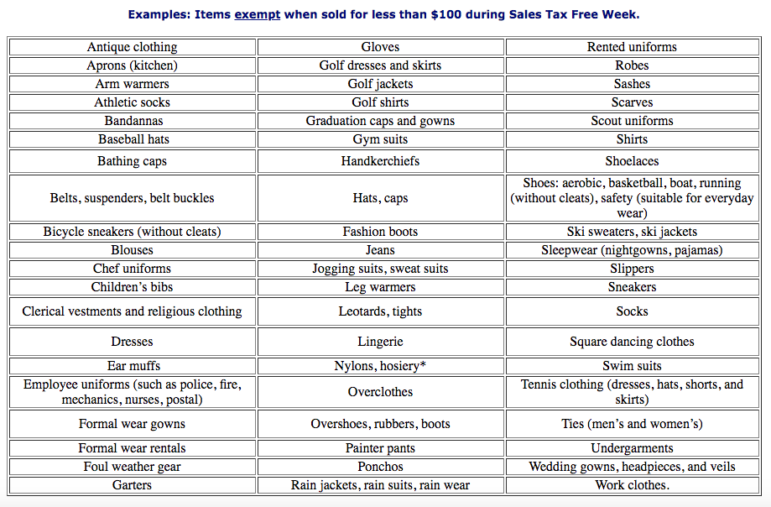 The one-week event eliminates Connecticut’s 6.35 percent sales tax on clothing and footwear costing less than $100 per item. — Information and much of the wording in this article is from an announcement from state Rep. Terrie Wood. Additionally, new and used college textbooks are exempt from the state 6.35 percent sales tax, if the items are bought by students who present a valid college ID at the time of purchase. Since sales tax is calculated after the use of any coupons or discounts, if the final price is less than $100, the sale is exempt from taxes. Clothing or footwear under $100 put on layaway is also tax-free. If you’ve got a question about whether your potential purchase is covered by the tax break, you can go to the Department of Revenue’s mind-numbing list of rules, exemptions, codicils, exceptions, regulations. The benefit has been substantially reduced from previous years and will only apply to clothing and footwear that costs less than $100. Connecticut’s Tax Free Week was first enacted in 2000, and applies to most clothing and footwear purchases intended for everyday use. Sorry! You pay the sales tax on these. Even during Tax Free Week. Here’s the offer, as it appears in this week’s Stop and Shop flyer, second to last page. Stop and Shop, including the chain’s two Darien supermarkets, has an offer allowing you to get $15 off your next purchase if you buy one of the $100 gift cards shown here and use your Stop and Shop card. The cards include one that you can use at Banana Republic, Gap and Old Navy, along with others for Kohl’s, Macy’s and non-clothing stores such as Best Buy, Apple and Staples. You can buy the cards through Aug. 23 at the supermarket, but you must go back to Stop and Shop to get the $15 off by Aug. 31, when the offer expires. You can combine that with the sales tax break and whatever sale you’re getting at the store. As the flyer says, there’s a limit of buying one card per transaction — meaning you can do it again and get the same deal.